The world is a big place. 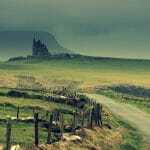 There are endless discoveries to be made high up on mountaintops and well below sealevel alike. Many visit it's vast wonders, but the truly inventive build restaurants within its nooks and crannies. From luxurious feasts perched on cliff edges to glass-enclosed dining rooms under the sea, we've gathered some of the most spectacular high and low dining spots around the world. 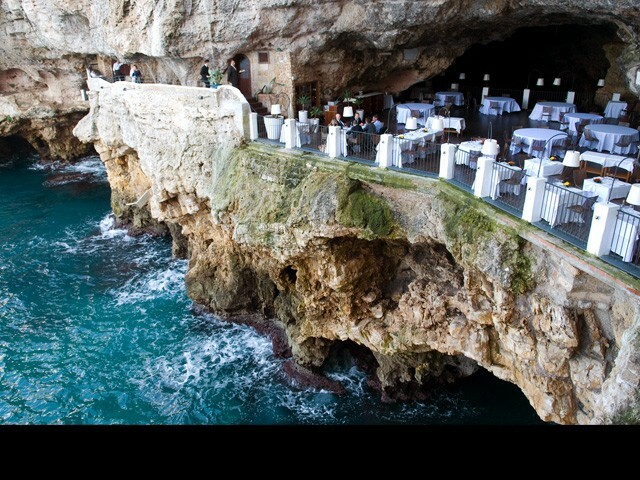 Grotta Palazzese, Italy – This magical restaurant sits 74 feet above the sea in a naturally carved grotto in Southern Italy. 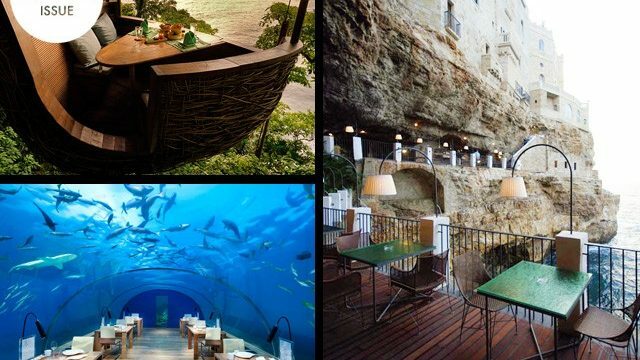 Picture this: savoring a delicious Italian meal while dining inside a cave that juts out over the Adriatic Sea. That dream can become a reality with a summertime visit to Southern Italy. Open from May to October, Grotta Palazzese is a restaurant nestled in the city of Polginano a Mare and offers diners one of the world’s most exotic restaurant settings. The grotta, or cave, was naturally carved out of the cliff’s limestone centuries ago and is now home to a magical spot 74 feet above the sea. Beautiful Italian dishes, the sound of waves crashing against the rocks and the experience of eating inside a centuries-old cave–what more could you ask for? Dining Pod, Thailand – Channel your inner (and much more sophisticated) Jane and George of the jungle by eating high up in the trees on the island of Koh Kood in Thailand. 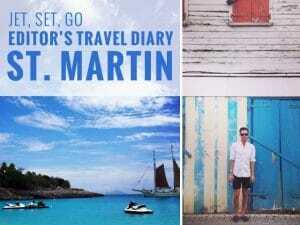 This is the kind of experience bucket lists were made for. 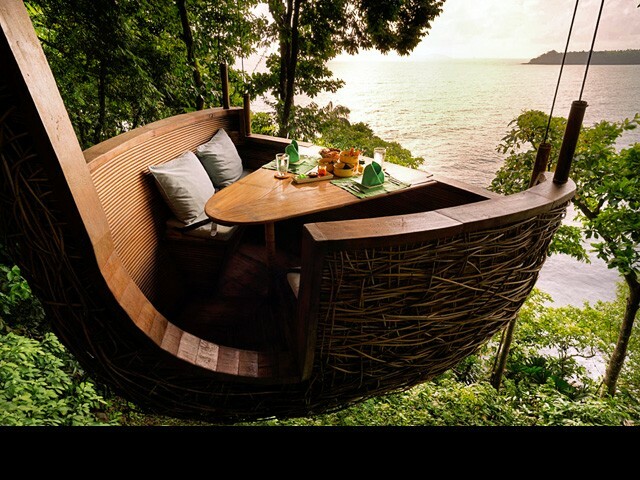 The Dining Pod helps you channel your inner (and much more sophisticated) Tarzan by eating high up in the trees on the island of Koh Kood in Thailand’s Six Sense Sonova Kiri Resort. This fine dining establishment allows up to four people to buckle themselves into what is essentially a bamboo pod, or an oval-like steel frame covered in woven rattan. Guests are hoisted 16 feet in the air amid the lush canopy of the jungle and gifted with a sweeping view of this enchanting island. Servers are considered flying waiters as they make their way about on a zipline to deliver locally-sourced meals from the resort’s own organic garden. It doesn't get more eco-friendly than that. 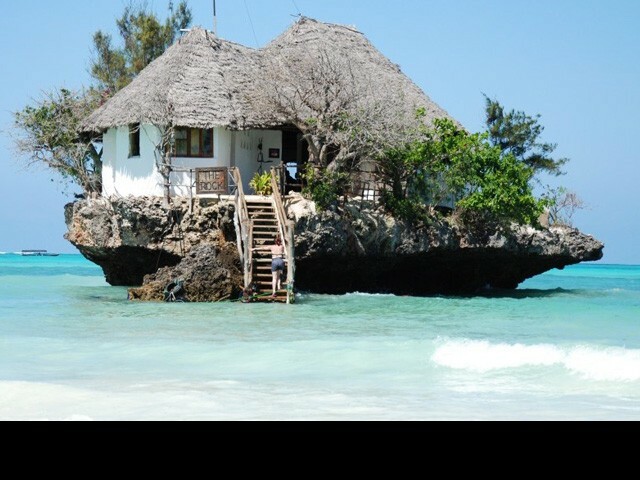 The Rock Restaurant, Zanzibar – Formerly a fisherman’s post, the Rock Restaurant is setk in the middle of the Indian Ocean just off the coast of Zanzibar. Formerly a fisherman’s post, the Rock Restaurant is set in the most idyllic of locations: perched on a rock in the middle of the Indian Ocean. Just off the shore of Michanwi Pingwe beach on the coast of Zanzibar, diners can walk to the location during low tide or arrive by boat service at high tide. Seafood reigns supreme at the restaurant that can seat up to 12 tables at lunch and dinner. There is no better way to enjoy the freshest meals than with a sweeping view of the coast and the ocean around you. The Rock Restaurant also features a terrace for guests looking to kick back and unwind with a drink while staring off into the horizon. At.mosphere Restaurant, Dubai – Take fine dining to new heights by eating 1,350 feet above the ground at the highest restaurant in the world at At.mosphere Restaurant in Dubai. 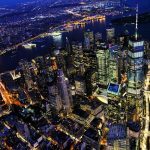 Take fine dining to new heights by eating 1,350 feet above ground at the highest restaurant in the world. At.mosphere Restaurant rests on the 122nd floor of the monstrous Burj Khalifa building in Dubai and graces diners with expansive views of golden desert married with patches of concrete in a way that only Dubai can. At.mosphere offers diners two choices: eating at the more casual grill or dining in the lounge. It may take weeks to secure a reservation, but it's worth the wait because there is more to this high-profile restaurant than the view. 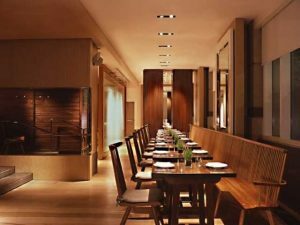 The menu is the brainchild of Michelin-starred chef Dwayne Cheer who focuses on simple, seasonal ingredients. 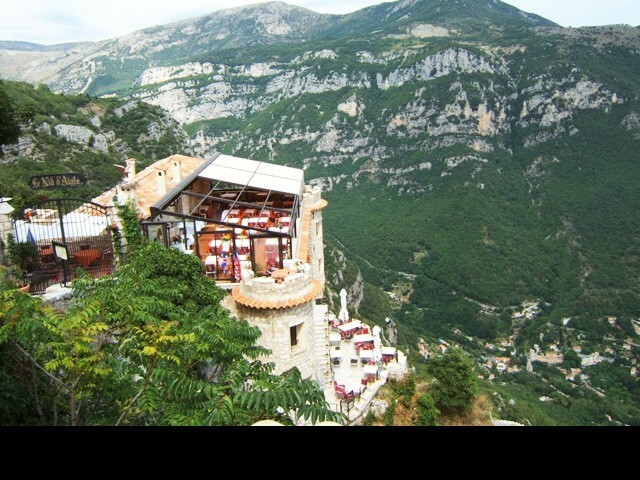 Le Nid d'Aigle, France – The “Eagle’s Nest” is renowned for offering diners one of the best views of the Alps and the Mediterranean Sea from the cliffs of Gourdon, an ancient village that clings to the mountainside. Le Nid d'Aigle, or “the eagles nest,” is renowned for offering one of the best views in all of Europe. The restaurant is perched on the cliffs of Gourdon, an ancient village that clings to the mountainside, offering a bird's eye view of both the Alps and the Mediterranean Sea. The food is just as superb as the breathtaking view and the cobblestone, fairy tale streets of Gourdon are worth a post-dinner stroll. Ithaa Undersea Restaurant, Maldives – Take your palates to new depths by dining under the sea in the Maldives at the Ithaa Undersea Restaurant. 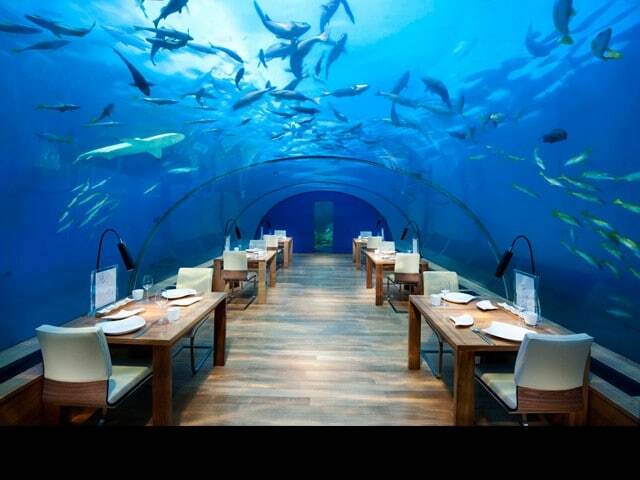 Take your palate to new depths by dining under the sea in the Maldives. The Ithaa Undersea Restaurant is the world's first all-glass restaurant buried 16 feet below sea level at the Conrad Maldives Rangali Island Resort. The restaurant was first constructed in Singapore before being shipped to the Maldives and lowered to the coral gardens that now surround it. Expect to see aquatic life swimming around you as you nosh on a six-course menu of contemporary European food and are surrounded by a 180-degree panoramic view of the surrounding waters. Make reservations at least two weeks in advance as this is a site worthy of buzz. Laino Snow Village IceBar, Finland – Guests sit on solid ice chairs, dine off solid ice tables and drink champagne from solid ice glasses at the Laino Snow Village. Warm up with a dish of sauteed reindeer. Constructed every November, the Laino Snow Village is a 215,000-square foot village made entirely of snow and ice. The massive space houses restaurants, bars and hotels in its location just north of the Arctic Circle. Put on your most fashionable long johns (at least a couple of pairs of them) and meander your way to this enchanting ice village. 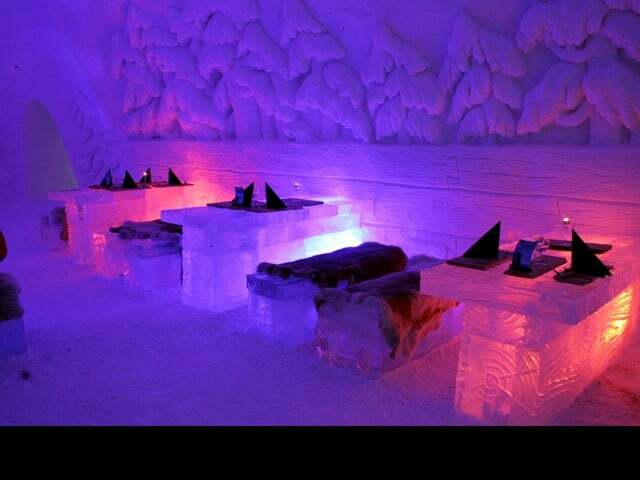 And make sure to dine at the IceBar Restaurant. Guests sit on solid ice chairs, dine off of solid ice tables and drink champagne from solid ice glasses with an a la carte menu that focuses on Lappish food. The bold will sample sauteed reindeer while rookies will appreciate the cream of potato soup with cold smoked salmon. Sounds of Silence, Australia – There is no better place to soak up a star-drenched sky than atop a red desert sand dune at Sounds of Silence in the Australian Outback. There's something inherently exciting about the simplicity of dining under the stars. There is no better place to soak up the sky than atop a sand dune near the iconic Uluru Rock deep in the Australian Outback. 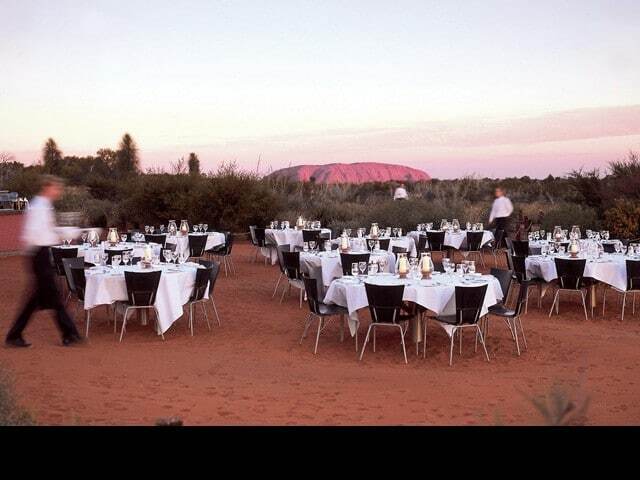 A night at Sounds of Silence begins with guests dining atop a red desert sand dune just as the sun begins to set. This four-hour long event features a gourmet barbecue feast that focuses on authentic Australian dishes including kangaroo and crocodile meats paired with Australian wines. The highlight? Guests can sit back and hear stories from a “star-talker” offering an indigenous perspective of the constellations above. 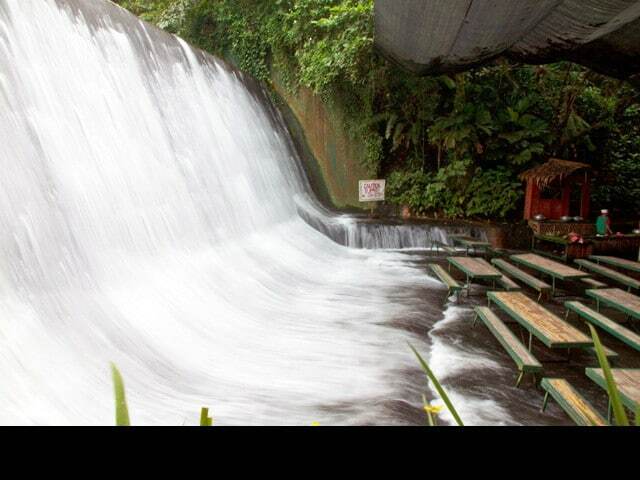 Waterfall Restaurant, Philippines – Sit at the base of cascading and thunderous falls as you enjoy your meal. Experience a dining rush unlike any other. Waterfalls Restaurant at the Villa Esuardo Resort in the Philippines sits at the base of cascading and thunderous falls. Don't be alarmed, this is a safe spot that allows diners to gently get their feet wet. Not only do guests enjoy their meals with fresh spring water flowing over their toes, they can also choose to go for a dip. Diners can feast on local cuisine, including fish and curried meats served in grass-fringed buffet stations while relaxing at bamboo picnic tables. 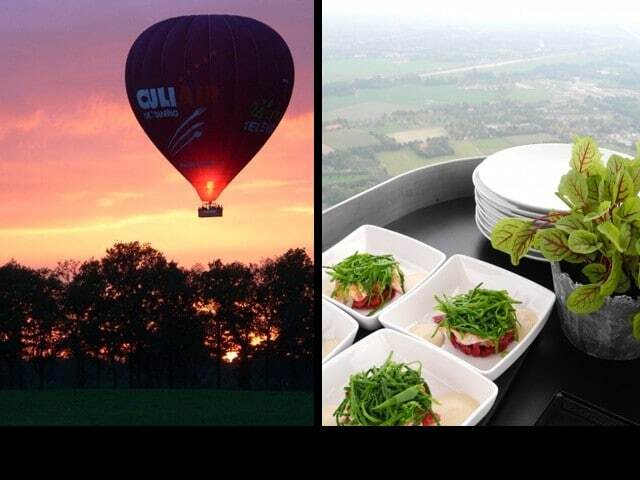 CuliAir, Netherlands – Master chef Angelique Schmenick demonstrates her culinary prowess by cooking with the hot air of the balloon itself at this restaurant that can seat up to 14 people. Revel in the world's only hot air balloon restaurant as master chef Angelique Schmenick demonstrates her culinary prowess by cooking with the combustion of the balloon itself. Soar over the gentle landscape of the Netherlands while getting high off this one-of-a-kind culinary voyage. This custom-built hot air balloon has been transformed into a restaurant and kitchen that can seat up to 14 people. El Diablo, Lanzarote – The hottest barbecue you will ever get is at El Diablo. Situated on top of an active volcano on the island of Lanzarote off the coast of Spain, the kitchen uses geothermal heat to cook for its guests. For the hottest barbecue you will ever get, head to El Diablo situated on the island of Lanzarote, just off the coast of Spain. Did we mention the restaurant is built on top of an active volcano? No need to fret, there won't be any eruptions with spewing lava while you indulge in your appetizers; this is a dormant volcano that last erupted in 1824. 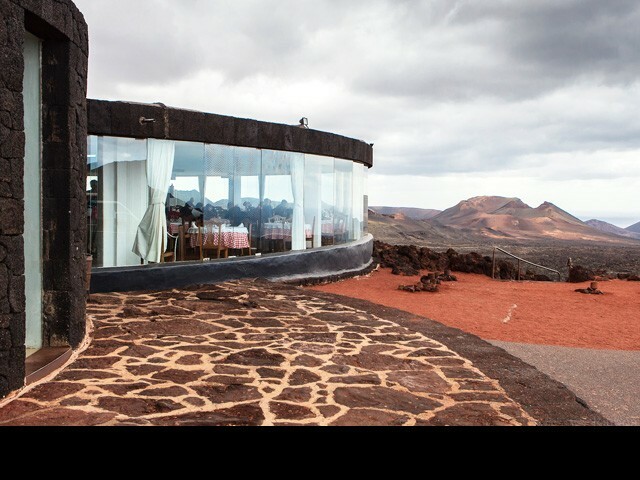 Located in Timanfaya National Park, the restaurant takes advantage of its location by cooking with volcanic fumes. 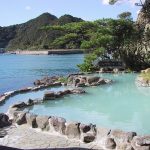 It features a large grill built over a hole in the ground that uses geothermal heat that can reach anywhere from 850 to 9300 degree Fahrenheit. So, literally get it while it's hot. Dining out is all about the experience, which is why you should opt for the Norwegian-inspired adventure that comes with a night at The Viking Yurt in Utah. Listen to live music from a baby grand piano and feast on an elegant six-course meal in this unique offer. The evening starts off in Nordic fashion with a 23-minute sleigh ride pulled 1,000 feet up into the mountains and pine forests atop Park City. The night continues with guests eating within in a yurt, or a portable structure often used in Mongolia. Sure, it's an entirely different culture but you won't mind while you're warm and cosy inside. 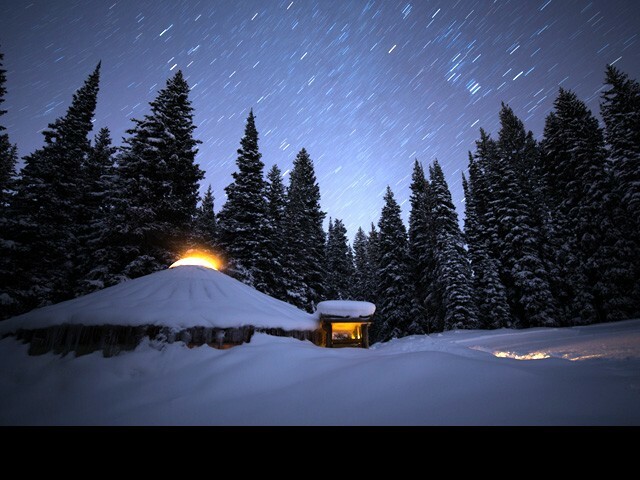 Pro tip: listen for the wind sweeping through the forests and stare up into the night sky through the domed skylight. Pure magic. 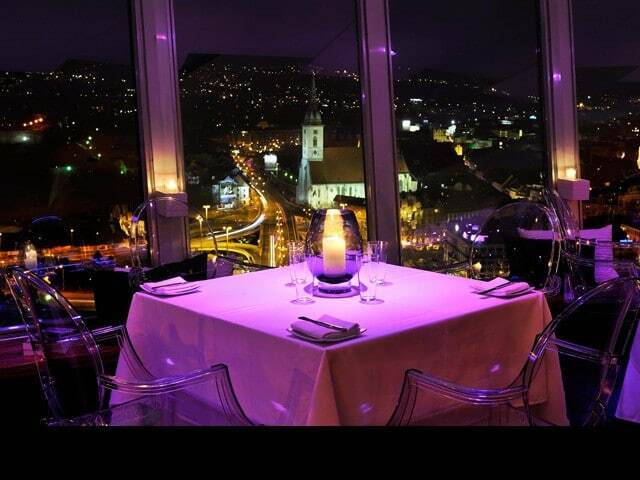 UFO Restaurant, Bratislava – Taste Restaurant inside Bratislava’s famous UFO offers unbeatable panoramic views coupled with a highly touted menu focusing on Mediterranean and Asian cuisine. It's time to add Bratislava to your destination wish list, if for this reason alone. Located inside the city's famous UFO atop the tower of New Bridge, Taste Restaurant offers an unbeatable panoramic view coupled with a fresh, seasonal menu of Mediterranean and Asian cuisine. 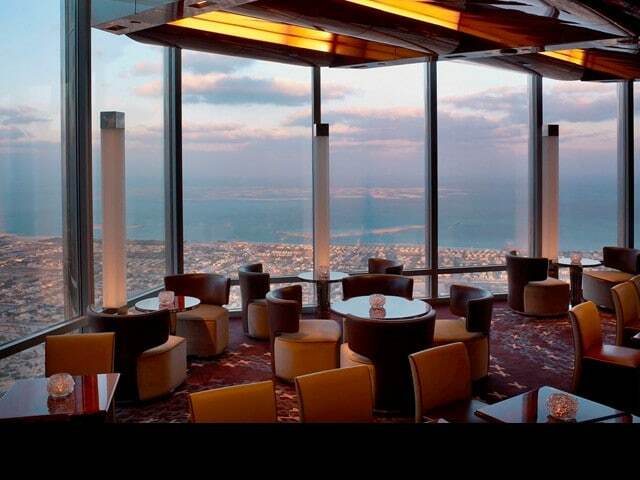 Take an elevator ride to the top and dine on a five-course tasting menu or pick and choose from a la carte dishes. Not in the mood for dinner? No problem. Enjoy a speciality cocktail while overlooking the Danube River, Bratislava castle and the sprawling city below you. Though we do recommend trying an item or two. One bite and you'll see why. DC-6 Diner, England – England's Conventry Airport houses the aircraft actually used in the James Bond Casino Royale Film and has since been converted into a restaurant. Airplane food is a common joke, but you'll rethink that punchline once you step onboard the DC-6 Diner. Take your tastebuds for a ride without leaving the ground. Launched in 2010, the DC-6 Diner is a converted 1958 Douglas DC-6 aircraft located at England's Conventry Airport. 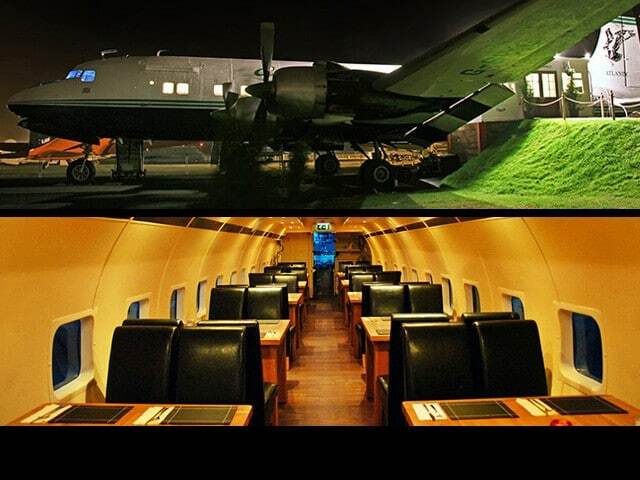 Heads up James Bond lovers, this actual plane was featured in ‘Casino Royale'. DC-6 Diner seats up to 40 guests for lunch and dinner, offering both a fully operational restaurant and bar. And, trust us, make sure you check out the cockpit before you've finished your meal. 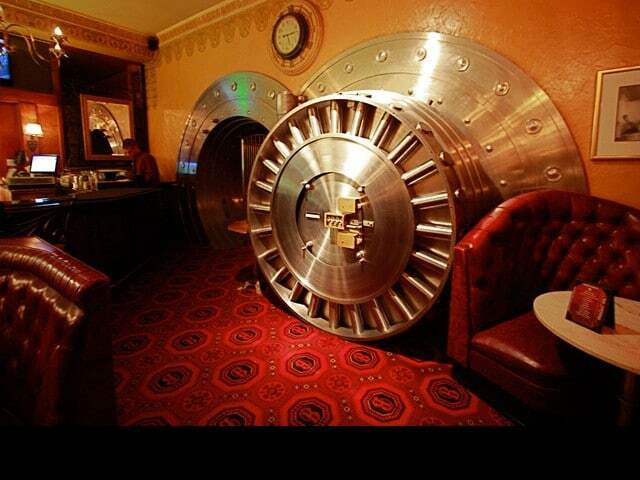 The Broker Restaurant, U.S. – The Broker Restaurant in Denver has a private room in the wine cellar 35 feet below ground in the bank's original cash vault. Built in 1903 and located in a former bank vault, The Broker Restaurant still stands as Colorado’s most unusual restaurant locations. Guests can eat in vintage, cherrywood booths that were formerly used by bank customers to view their safety deposit boxes. The highlight is a private table in the wine cellar located 35 feet below ground in the bank's original cash vault. The Broker is famous for being one of Denver's oldest seafood restaurants and steakhouses, yet it seems that most patrons come here more for the atmosphere than the flawless dining. All tables receive a complimentary bowl of their trademark steamed gulf shrimp, but banks aren't known for giving things away for free. The pricey menu is worth the fare but, who knows, maybe you can take out a loan to pay for your bill. 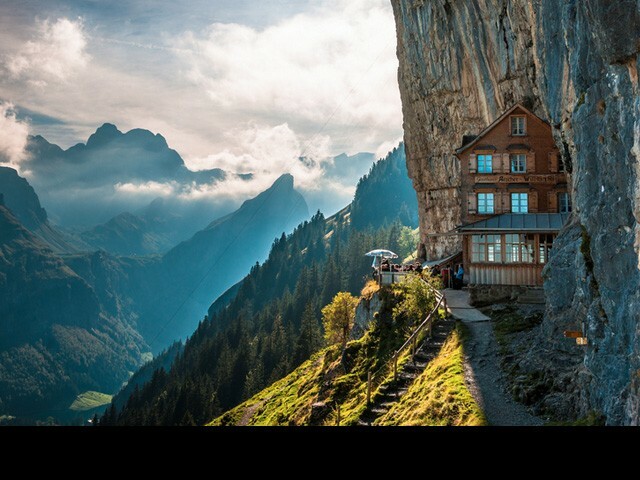 Berggasthaus Aescher – This 170-year-old guesthouse is atop the rolling hills and mountains of Switzerland. It's worth the strenuous hike. This 170-year-old guesthouse is situated at the top of a mountain in the rolling hills of Switzerland. Take a cable car up to the top while soaking up the scene, but don't be fooled, getting there does require some exertion. Work on your appetite on the trek up to the restaurant and be rewarded with some of the best views you've ever laid eyes on. A trip to Berggasthaus Aescher will be a rewarding feast for your eyes and your stomach. 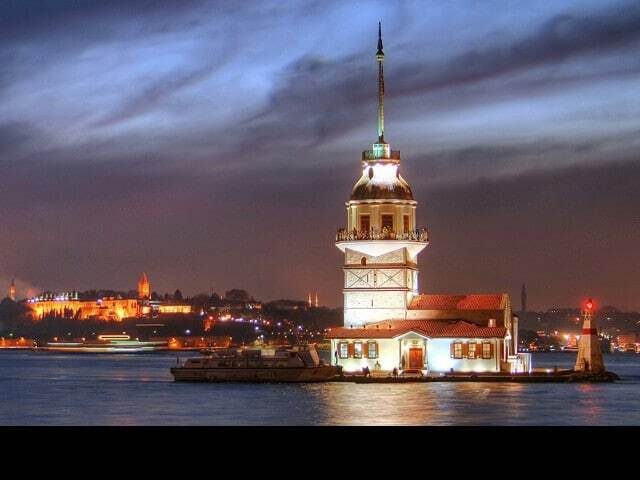 Maiden's Tower, Turkey – This unique view allows you to look out onto two continents: Europe and Asia. This a venue that cannot be missed on any trip to Istanbul. Smack in the middle of the Bosphorous Strait and placed on its own little island, Maiden’s Toweroffers a view of two continents at once: Europe and Asia. This is a venue that cannot be missed on any trip to Istanbul. Small boats bring you to and from the restaurant, where you can wine and dine your night away. After noshing on delectable dishes, make your way up to the top of the tower for a breathtaking look at both influential sides of this historic city. Make sure to visit these top spots to take your palate to new heights–and depths.